Wow! The man who has studied geniuses for decades now has grown into a genius himself. WTF: the man IS a genius. I had the privilege to participate in the latest training-seminar of Robert Dilts which is organised almost every year in the Netherlands (thanks to IEP). On 26-27-28 october Robert gave his latest views on conscious leadership and how to create a better business. 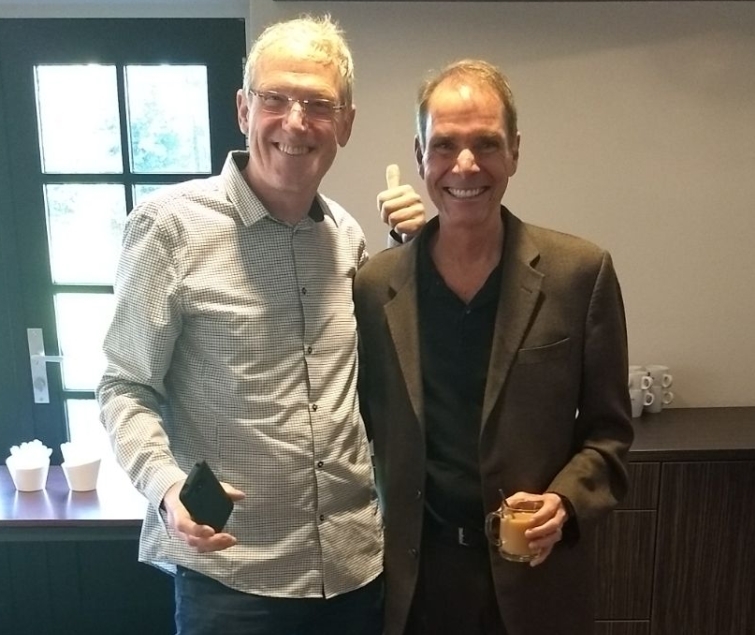 This was his 33th visit to the Netherlands as a trainer and inspirator for the NLP-community. Who is Robert Dilts and what is this all about ‘succes factor modeling’? What are the main differences in getting a better business in terms of Dilts/SFM versus ‘traditional’? How is Dilts helping making the world a better place? My message, request or maybe calling to Dilts to let his genius shine (also) on another route to a better world. Dilts is one of the worldwide founders of the NLP-movement. From early in his twenties till this day he continously adds new tools, insights, workshops and books to the Neuro Linguistic Programming community (ouch, that term was not chosen for ease of communication) (see here for more clarification on NLP). So, on from the seventies till this day, we can look up to a pile of some 20 something books from the master. Quite some time ago he started studying geniuses from history, ranging from Leonardo da Vinci to Walt Disney. What makes their succes? What did they do that made them stand out from others? What was the difference that made the difference? A lot of people nowadays use the ‘Disney Strategy’ to better their plans by asking the dreamer, realist and critic in them what to do and think. This so-called ‘Disney Strategy’ was originally proposed by Dilts from his study of the man (Walt Disney) and his works. It was this volume 3 or III that was amidst our group to discuss and live through with our body and mind and testing it upon our own projects in Groesbeek and its beautiful surroundings. I really hate to confess that I did NOT (I repeat: did NOT) read the whole books from start to finish. Shame on me. The things I share with you are purely based on the workshop and the material that was handed out to the participants of the seminar last week. Before going into more detail, it seems important to me to get some terms into the right perspective. 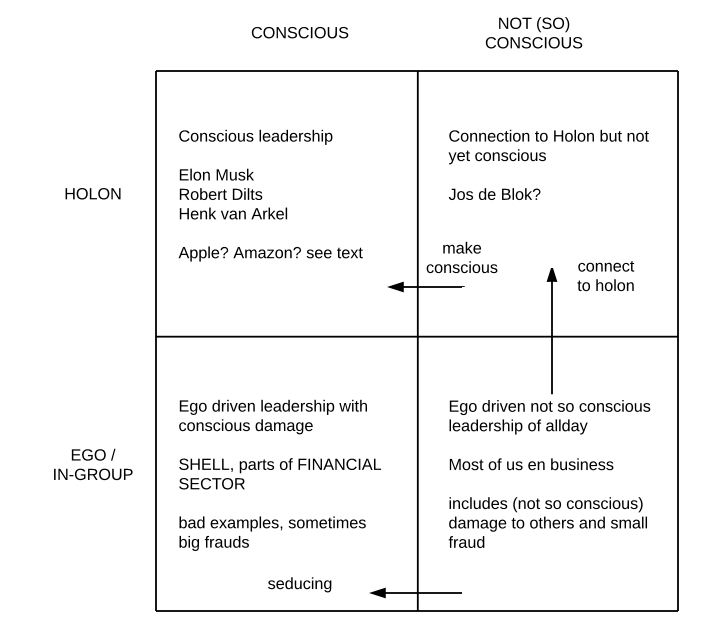 Conscious leadership: what is it? Succes (as in SFM): same question. Succes does not mean earning more money or driving a bigger car. You are the owner of your succes so it’s you who defines what your succes is about. In my own words I would say that succes is achieved in the process of going from your present state (that is perceived as not yet optimal) to your desired state (which is of course that state you want to be in the future). We at ‘slimme financiering’ would say that the ‘return on investment’ is the amount of effort you have put in relative to the amount of ‘gap-bridging’ that results (where the ‘gap’ is the difference between present and desired state). The higher the rate of return (ROI) the higher your succes, the faster you go towards your desired state. 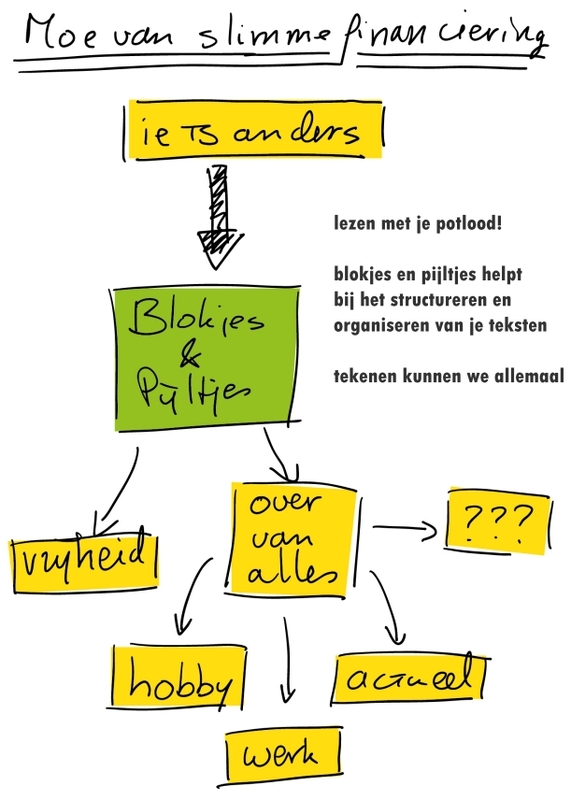 (see for instance our decision tree in Dutch). Are you still there? Okay, no problem, the point is that succes is measured in terms of your own future desired state (doesn’t have to be in terms of money or market share, can be innovation, well-being, customer satisfaction or whatever). You thought it was all about getting rich in the shortest time possible? Sorry. Could be an option for you though! But better to look elsewhere I guess. Then the second disappointment maybe: what is leadership about? It’s not about being the alpha-male that fixes things and lead you all the way to a more prosperous future. Leadership is in all of us and it is about the capability to lead ourselves in realising our dreams. It’s about getting others to go along with us, about getting cooperation in realising your dreams and visions. Conscious means that you are striving to do this with all your heart, soul, body and mind. Conscious means that it is no coincident that your vision comes to reality. Of course there can be luck (or bad luck) in play, but as Dilts says: luck is when some good chance comes by and you can grab it because you are prepared and ready to take it. Now it may seem that Dilts and his SFM is in the end about living a better live. Not about business, in the sense of making things an providing services in an organisation where people and resources work together to make profit or whatever. Well, I think Dilts I-II-III in a certain sense IS about living a better live. It’s not per se on business alone but also about having a good balance between work and family, between resting and working etc. That’s because a sustainable business has to reckon with these other factors too (that the presupposition here). But volume III and our workshop/seminar were nevertheless put mostly in terms of getting your business and your project more succesful. It’s about what we traditionally do in formulating our mission, vision, strategy, 5-year plans and their execution to give us better products and more return on investment. You know: the speech of our bosses at the X-mas gathering, it was a good year but for next year we want you to give that extra piece of commitment so we can satisfy our shareholders some more. GO GO GO. That kind of business talk. Doing better projects by working harder and not complaining, because the boss told you so. If it’s good for the business, it’s good for you, win-win, blabla. Rudy: don’t get cynical, that’s not NLP! Okay, I get it. Into the COACH-state thou shallst go. So what’s SFM’s way of going to a better future for your project, initiative or business? I made the next chart to get an idea of the bigger picture. It is not feasible to go into details too much in this blog about Dilts’s SFM. I guess you recognize the part in the middle: the part that is going from the present state (we can do better than this!) to the desired future state (that’s the way we want it to be, so better, bigger, more of it). But in the upper part of the chart you see some extra noise (passion, coach state etc). And there is the part about story boarding, reverse planning etc that we does not look familiar either. So apart from some strange add-ons it looks kind of familiar. 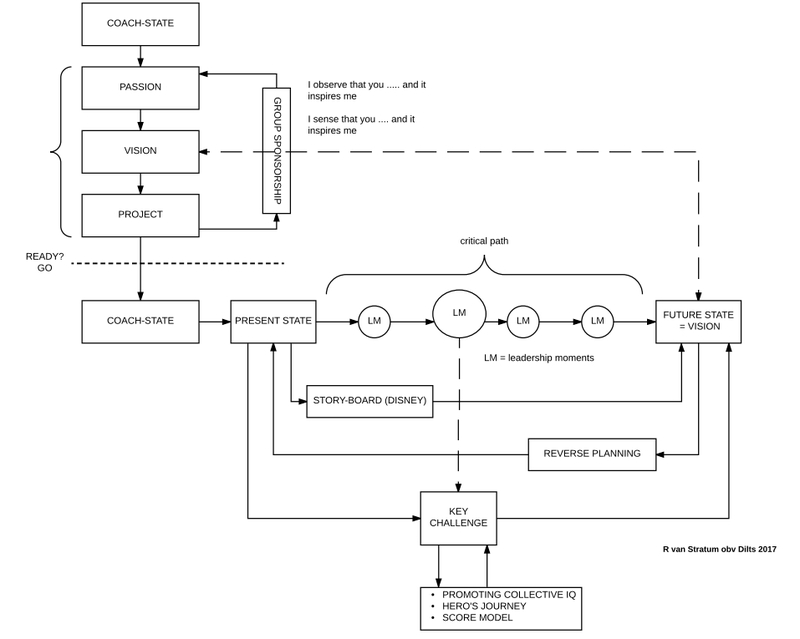 I do some more styling and do a simplified version of the SFM-approach vis-a-vis the way we most of the time do it (and yes: there is no one way of traditionally doing it, but you get the picture). 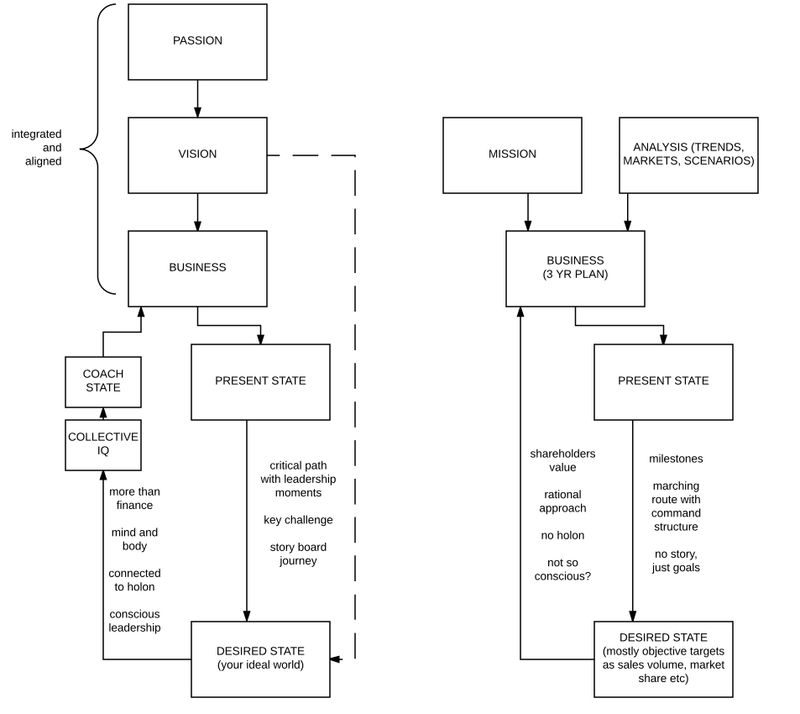 To the left you see the simplified version of getting a better business of NLP aka SFM aka Dilts. To the right you see a grossly simplified version of how some do the same ‘as we know it’ from our business-courses. SFM starts with the holy trinity of passion-vision-project. It’s personal and from the heart. It’s the piece of rock (aligned and well) the keeps returning in the picture to check if everything is going well (kind of reference: is the passion still there?). Passion is what you care deeply about and for which you have talent and pursue it with all of your heart. Vision is an ideal and desired mental image of the future state. TRAD (I take this as nominator for the way we do this ‘traditionally’) starts not from passion and from individual ‘heartness’ but from a mission that comes from the business itself (aka which is stated at the website, we care about the world, we do sustainable things etc oh, there I go again). TRAD takes into account the facts and trends that we are confronted with. It translates this possible state of the future into the consequences (chances, threats etc) for our business in our market. So the desired state of TRAD is more like some view of our business in the real world of tomorrow, a rather factual state of affairs, related to volume of sales, profit and market share. Where SFM has in its place a vision that is a dream of the world of tomorrow, it’s about an ideal world where you want to contribute to (belong to). In SFM you are connected to the world at large, to the community, to what is called the HOLON. You look at the consequences of your actions for all the stakeholders including future generations. You are there to create real value added for society at large now and in the future. TRAD takes (as I see it) often only the own succes into account. It’s most of the time not connected to the Holon but to the own business and its shareholders and/or employees. The steps from now to future are TRAD rather factual and like orders to be given. SFM states that for a connection to the selves and the Holon there must be a story or journey, because that’s what inspires us, which gives us energy and determination to succeed. Well, I could go on and on, I leave the puzzle for you to explore and make it your own. Well, now I come to some moments of evaluation and reflection (going to third position, saying this to keep rapport with the connoisseurs). Yeah, I know, this SFM-thing sounds rather softish and idealistic (as in: not so realistic). And I think: maybe you are right about that. As a former researcher and scientist, if I want to know what succes is about I would look for a definition of what is seen as succes and look for examples or manifestions of these forms of succes. So that is rather factual and plain (in the sense that I don’t have some ideal picture about what succes should look like). I did NOT do this research, so I have no ground on saying anything on this. But my hunch is that most people think of and act on succes (see the succes-literature, especially the American books on the topic) as earning a lot of money, getting rich and riding fancy cars and showing off that this all is about you being so damned good. So then you would look for people and businesses that did realise these dreams of succes. Then, maybe you would get the results that Sam Wilkin arrives at, see this blog that I wrote about that book (Subtitle: How the rich got rich). Wilkin has studied people that became insane rich and what they did to realise that dream. This is not necessarily a nice picture though, because the study shows that a lot of (other) people have suffered during this road to richness (well, bad luck for you then). But this is not what Dilts has done. He aims for a better world (making this world a better one) and takes into account the bigger picture and balance. He then looks for role models that fulfill this promise of let’s say ‘weighted succes’. Earning a lot of money is okay but receiving goes along with giving (for instance). Money goes along with realising other values. So, enter the Elon Musks and Steve Jobs of this world. This is not about factual empirical succes in terms of money or richness but about a chosen broader vision on succes (including the passion and holon etc). And sticking with a ‘scientific’ approach to succes: what do you have if you know how some genius did his trick? You know that you can realise your dream doing this genius-strategy. But what about other persons that do this same strategy and do NOT succeed? What about other persons who do something completely different and also realise their dreams. From an ecological perspective (see, I don’t use the term ‘scientific’) it would be better to actively look for counter-examples so that you can deal with the ‘shadows’ better. Are there entrepreneurs that don’t care about passion or holon that still have this kind of ‘succes’ (money AND a nice time AND don’t work to hard AND good family live AND adding real value)? Are there entrepreneurs that got all it takes according to Diltses studies and don’t go nowhere? I’d like to know. Okay, I understand, nothing wrong with studying good role models with a holistic view on succes. Look at the box below, this is how you can look upon these matters too. 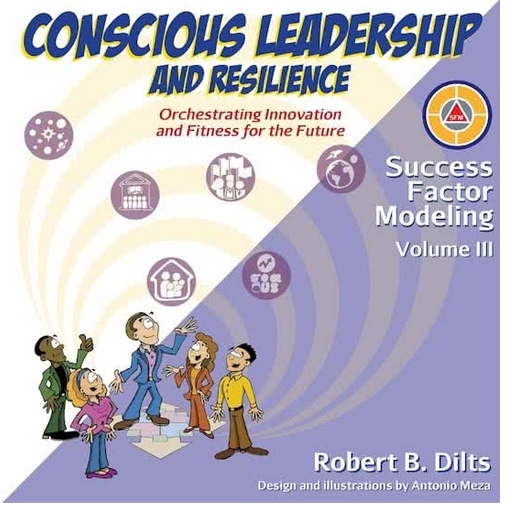 You have the ideal of conscious leadership where Dilts is pointing us to. I know several of these people. I think from the bunch of ‘great names that everybody comes up with in their powerpoint presentations’ Elon Musk is an outstanding example and role-model. I agree but sometimes can’t help Musk is the exception to the rule (how many entrepreneurs have this longing to make Mars into a place to live on?). If you come up with Steve Jobs I’m not so sure anymore. If you come up with Jeff Bazos of Amazon I’m not sure at all. Is the world a better place with the vision of Amazon that we can buy all kinds of stuff online and fast? I’m not sure. Is there a connection to the Holon? Still I’m not sure. We’ve asked this in the seminar and Dilts’s response was something like: a) it’s good to have the questions and I don’t have all the answers (fair enough), and b) it’s the process of asking the right questions in becoming a more conscious leader and dito business (so assuming that Amazon is on some path of more consciousness and will eventually alter their strategy by getting new insights from the Holon, which could be the case by the way). I would like to have some examples of less visible people that aspire to the same things and are conscious leaders and good examples too. In the Netherlands the name of Henk van Arkel comes to mind. He is fighting a live-long battle to solve the poverty-traps of poor people and countries by developing software for new currencies and more humane forms of banking, saving and spending. I’ve written about him in several pieces here at this site. Maybe we can help him to have still more impact and progress. I for one would like to. And there are people who are connected to the Holon (can you please stop spelling this with a capital H?) who maybe are not that consious. Recently I saw a documentary of ‘Tegenlicht’ where Jos de Blok has been leading the way for a whole new route of giving better care to more people in need. Please give him the floor and if possible create some more consciousness and do the upscaling (to other businesses and/or entrepreneurs). But I’m digressing. This is not the point I want to make. I’m not happy with the ‘grow into more consciousness’ thing when it concerns some big multinational enterprises. Sure, focus on the positive, that’s NLP too, I know. I suspect a lot of them ARE conscious but driven by ego’s and not-so-holon visions. Just en route to the seminar at day 2 (last friday) I listened in the car to a story of Harm Botje of Vrij Nederland about a big case of corruption right up and at the desks of the key-leaders of Shell. The proof is there (so it seems now) that they were fully aware of their fraudulous actions (just to get more money for their own good). So when true it’s a good thing these people go to trial and eventully sentenced to prison. These are bad examples and probably cases of big frauds driven by visions that are not connected to no holon whatsoever. NO NO NO. It’s even worse than this! These frauding companies have nice stories or journeys on their websites maybe inspired by holon-green-washing stuff from Dilts or whatever name with street credibility. And these FAMGA-like entities are getting bigger and bigger and more powerful than nation-states. They are evading and shifting tax-duties (Starbucks comes to mind, but the list is long) and crowding out the necessary funds for getting a ‘world in which we want to belong’. They are creating a non-level playing field for the conscious holon companies (not paying that much taxes and outsourcing your troubles to other parties down the line does play a rol in keeping prices low). And can even trigger these good ones into stepping to the other side of the equation too. The bad is crowding out the good, so it seems. And in the end we (we consumers, we small businesses, we employees) are all prone to bad examples and wrong seduction (not NLP this!). As Dan Ariely claims: we are all up to some forms of small fraud. So please, prevent us from doing the wrong things. Invent some nudges. See the picture below. The strategy of Dilts is making this world a better one by leading the way for better business that add to better societies. He wants to let us get inspired by the good role-models and expand the holon-oriented businesses and practices. This is good, this is empowering, this is okay. And maybe we can’t ask for more. After 20-something books, it’s our turn. Could be. But still: may I try? Could the genius of mr Robert Dilts be put to still better results? Maybe it’s a matter of ‘rate on return’ on the efforts of Mr Dilts. Now we have the books and the vision with tools of SFM I-III: there are lots of people who can do their things with this material in the real world. The word has been spread and good leadership will grow anyway by putting SFM into practice. But look at the other option, maybe we can do both. I’m not saying that the banking- and Shell people are bad people. That would not be NLP and rightly so. And I would crumble myself with my own shadows by focussing on the negative. I ask for analysing the dynamics of bad examples of the wrong kind of leadership. How can this happen? What is at play here? It’s about group think, about tunnel vision, about big ego’s and what all. It’s not about bad people but about bad practices that can go on and on while detrimenting others and the environment. 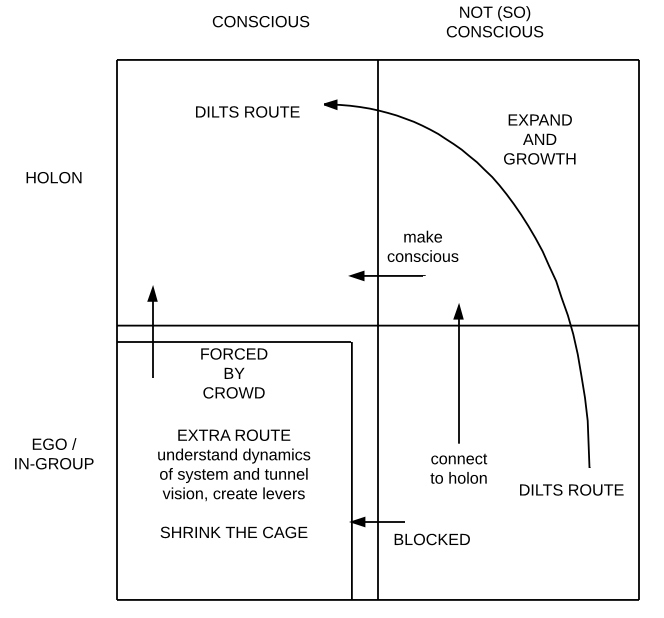 The complimentary strategy of the new volumes Dilts IV-V-VI would be to let shrink the container of EGO-NON-HOLON. Put it in a cage, make it a container with semi-open walls. Stimulate flowing out of the cage, put restrictions on contaminating to outside of the cage. Intermezzo: should we model crooks? After writing this blog I had some discussion. What is it exactly what you say? You don’t expect us to take ‘bad guys’ or ‘crooks’ or ‘frauds’ as an example that we should model as an example? Are you? Well, this is exactly what I could have been saying. We should look at other types of ‘leadership’, so yes it is a good thing that we better understand what’s going on there, what’s their definition of succes, and what’s their strategy on their way to ‘the top’? So suppose we’ve done this: then what? So you could copy their strategy? So that we could all become crooks? Is this what you want? How does this help us in getting a better world? Well, it’s up to you of course what you do with the lessons learned. I say that it’s good to know what’s going on (in these minds, in these contexts) so that you can reckon with that too and make your own strategy a better one. And maybe the crooks are not what they seem to be, we are open to all conclusions that come out of the modelling proces. Just learning, just discovering. We can model our own ‘mistakes’ (being an expert at doing the ‘wrong’ things again and again) so why not model the persons that are expert in .. (you give this a name, but things that can be in the way of attaining our vision)? And I would not leave it at that. After we’ve learned more about the ‘crooks’, we can get a better picture of the dynamics of the system, why do some (undesired) outcomes appear some of the time? What then can make a better study on what intervention can best be done to mitigate harmful effects (intended or not). I don’t know yet which interventions are there that will work (maybe none) but could be as simple as a change in tax structure or ‘naming and shaming’ or … just do what seems to work and make the system a better and more sustainable one. So, if you are still with me: please let me know if you know somebody that fits the bill and is willing to be modelled 🙂 ! Please Mr Robert Dilts: shine us a light on ROUTE 2 and write us three extra volumes with tools and insights with your genius so that we get a better level-playing-field and put the shadows in a cage or container. YES YOU CAN. We will help where possible!